Adjusting stocking rates on at least a monthly or seasonal basis in response to available pasture will increase pasture utilisation and will reduce requirements for supplementary feed. Climate variability and drought are common events in northern NSW and need to be considered in routine stocking rate decisions. In a native perennial grass-based pasture system, the effects of a variable climate can be managed with flexible grazing, and by integrating alternate forages (e.g. oats and lucerne) or providing adequate protein and energy supplements. While the annual average rainfall of Barraba from 1882-2004 was 692 mm, it ranged from 326 to 1174 mm/year. Rainfall in nearly one third of all years was more than 100 mm below average and many of these dry years occurred consecutively. Predicted pasture growth rates ranged from 3 to 36 kg DM/ha.day for winter and summer, respectively. These large seasonal differences are a challenge and indicate short time frames for varying stocking rates in response to pasture growth. These rates also indicate the need to fill the winter-early spring ‘feed gap’ if breeding enterprises with high weaning percentages are desired. Modelling of intake by Merino wethers indicated that adjusting stocking rates in relation to available pasture on either a monthly or a seasonal basis increased pasture utilisation and decreased supplementary feed. Modelling of intake by Merino ewes and lambs in this environment indicated that animal requirements were best met by a fertilised native pasture containing a mix of C3 and C4 perennial grasses, oversown with an annual legume. Increasing stock density is a simple way to increase pasture utilisation, but comes at a cost of increasing need for supplementary feed as a proportion of total feed intake. Higher pasture utilisation can be achieved by increasing stocking rate or maintaining stocking rate and opportunistically trading lambs in summer-autumn while adjusting stock density every three months based on feed availability. 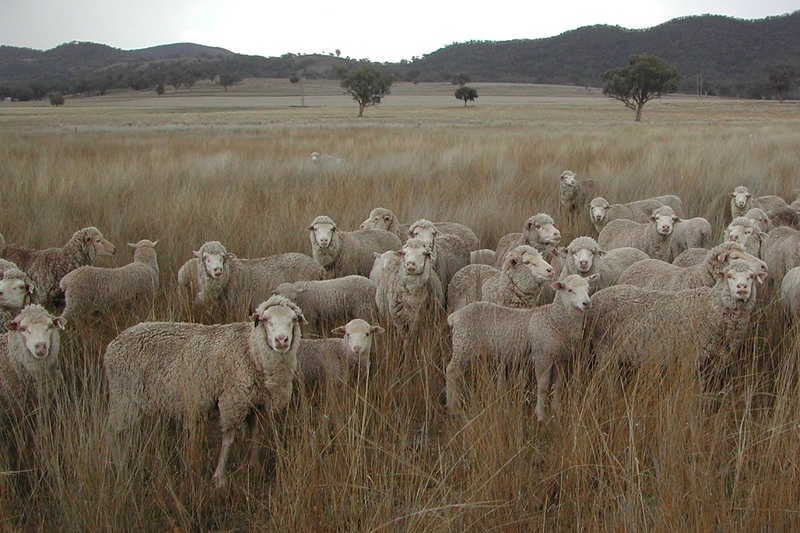 For spring lambing Merino ewes in a native grass based pasture system, climate variability is best managed with flexible grazing, and integrating forage oats and lucerne or by providing adequate protein and energy supplements to achieve high weaning percentages. Pasture utilisation is widely regarded as a key driver of profitability for the red meat and wool industries in southern Australia (Lodge et al. 2012). On-farm, this means increasing animal intake of green pasture growth. Using more of the green pasture grown throughout the year is often the most cost effective way to lift the productivity of a grazing enterprise. However, in grazing systems having a constant stocking rate, little attempt is made to increase intake in response to increased pasture growth within seasons and between years and so pasture utilisation is traditionally low. 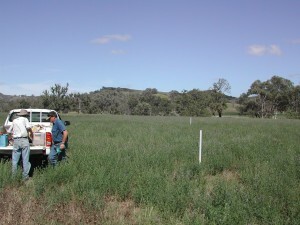 This situation often occurs in northern NSW, where native perennial grass-based pastures are dominant, and tend to be stocked year-round at about their winter carrying capacity, and under utilisation is manifest by the carry over of a large amount of dead standing material from year to year. This study used pasture and livestock modelling to demystify the concept of pasture utilisation and so provide benchmark values for different pastures and livestock enterprises to increase profitability. Grasslands dominated by summer-growing, native perennial grasses occupy more than 44% of the Namoi Catchment in northern NSW. The major native grasses are frost susceptible, produce little green growth in winter-early spring and generally have low levels of metabolisable energy (ME), crude protein and digestibility, making them unsuitable to livestock enterprises that involve fattening or breeding, without the use of supplementation. In recent times there has been a trend towards increasing numbers of cattle outweighing a decline in sheep numbers, resulting in higher total DSE grazing pressure, thereby raising the feed demands from native grass based pastures. However, these higher demands may not be met in all seasons since climate variability is a feature of the region. Resilience of sown pasture species and their ability to adapt and respond to a variable climate are important features for their long-term productivity and persistence, particularly with the climate change scenarios forecast for northern NSW. In southern Australia, utilisation of pasture is typically 25-30% and an increase of up to 20% could double farm profit (MLA 2011a). On-farm, increasing pasture utilisation involves increasing the animal intake of green pasture growth. While intake is influenced by pasture height, density, total herbage mass and digestibility the aim is to maximise the stock density that a pasture can sustain without restricting its regrowth and long-term sustainability (MLA 2011b). However, within a grazing system if intake exceeds pasture growth then different animal enterprises may need to be considered, or alternative higher growth rate pastures/fodders may need to be used. The SGS Pasture Model has the capacity to simulate a range of animal production enterprises including beef cattle (incorporating both cows and steers), ewes and lambs, and wether sheep for wool growth. As northern NSW grazing systems utilise a range of forage options, a range of default species were added to the model including tropical grasses, forage oat and lucerne. The range of animal types, grazing management practices, and forage options available within the SGS Pasture Model make it ideal to explore the likely impact of climate variability on animal production. Daily weather data for 100-year periods were abstracted or interpolated for each analysis from the SILO Datadrill. In the model, animals were provided with supplementary feed if their metabolisable energy (ME) intake from pasture declined to below levels that met 60% of their daily requirement for wethers or below 95% for lactating animals. Supplement was taken to be any other feed source, including pastures, forages, or feed mixes that provided the required amount of ME. Three simulation studies using different pasture and livestock systems were done to illustrate strategies that may be used to better handle climate variability in northern NSW. The SGS Pasture Model was used to establish the effect of raising stocking rate on intake of pasture and supplementary feed and to calculate mean long-term stocking rates when wether numbers were adjusted monthly, seasonally, or annually for a 99-year period from 1906 to 2004. The site on which the simulations were based was at “Springmount” (30o 34’S; 150o 38’E; 510 m a.s.l. ), 20 km south-east of Barraba on the North-West Slopes of NSW, on a Red Chromosol soil, with a pasture dominated by both C4 (summer growing) and C3 (year-long green) perennial native grasses, with few legumes and forbs present. All simulations were for a 100 ha area, with the pasture being grazed to a residual herbage mass of 1000 kg dry matter/ha (kg DM/ha). to determine mean long-term carrying capacity of the native pasture, when wether numbers were periodically adjusted every 30 (monthly) or 90 (seasonally) days, or annually. In this study, the SGS Pasture Model was used to establish the relationship between total annual rainfall and pasture intake (kg DM/hd.day) of Merino ewes and lambs grazing one of three different pasture types for a 100-year period (1906–2005). The site on which simulations were based was at Gowrie, located 20 km south-west of Tamworth, NSW (31o16’S 150o52’E; elevation 490 m a.s.l.). All simulations were for a 400 ha area, subdivided into four paddocks (each 100 ha) and rotationally grazed (on fixed time rotation with 14 days grazing and 44 days rest) at a stocking rate of 3.75 ewes/ha. All pastures were grazed to a residual herbage mass level of 1000 kg DM/ha and predicted annual intake (t DM/ha.yr) of both pasture and supplementary feed was expressed as a percentage (%) of total intake. Output data from these simulations indicated the ability of the different pasture types to provide animal intake within the variation seen in the long-term, historical climate data. 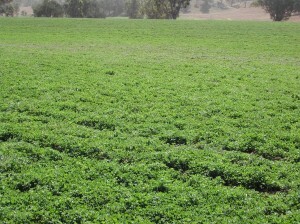 a fertilised lucerne (Medicago sativa) pasture. Fertiliser (phosphorus, potassium and sulphur) was applied at rates sufficient to maintain the soil nutrient status above a growth limiting factor of 0.75. The SGS Pasture Model was used to generate daily pasture growth rates for a native perennial grass pasture and then examine the effect on pasture utilisation by Merino wethers of increasing stocking rate under continuous grazing or adjusting stock density at regular intervals. The site on which simulations were based was growing a C3/C4 native perennial grass pasture at Glen Innes (29o 42’S; 151o 42’E) on the Northern Tablelands of NSW. For all simulations, fertiliser was applied to maintain soil nutrient status above a growth limiting factor of 0.75.
four variable stocking rates (stock density adjusted daily, monthly, every two months or every three months according to feed availability). For the simulations described, predicted pasture utilisation percentage (predicted net daily pasture growth (kg DM/ha.day)/predicted daily animal intake (kg DM/hd.day) x 100) and stock densities (wethers/ha) were compiled to monthly and annual summaries. Increasing the continuous grazed stocking rate from 2 to 4 to 8 wethers/ha caused the mean annual pasture intake to increase from 0.69 to 0.82 t DM/ha.yr and then decrease to 0.60 t DM/ha.yr (Figure 1). Increasing stocking rate caused the amount of supplement that was needed to almost exponentially increase from 0.05 to 2.0 t DM/ha.yr (Figure 1). This represented a decline in the percentage of total intake provided by the pasture from a mean of 93% at 2 wethers/ha, to 59% at 4 wethers/ha and 23% at 8 wethers/ha, indicating that higher stocking rates are likely to be unsustainable. The effects of varying stocking rate using monthly, seasonal or annual adjustments to wether numbers are shown in Table 1. As the adjustment period increased, both the mean annual stocking rate and intake of supplement increased, but predicted mean annual intake of pasture tended to decline. Importantly, if stocking rates are adjusted monthly or seasonally in relation to available pasture, predicted pasture utilisation increased and supplementary feed requirements declined. These time-frames for adjusting stocking rate are feasible in practice and indicate that simple variable stocking rate strategies may be of considerable long term benefit. Figure 1. Mean annual intake from native pasture and supplement (tonnes DM/ha.yr) over a 99-year period (1906-2004) at stocking rates of 2, 3, 4, 6 and 8 continuously grazed wethers/ha. Table 1. Mean annual stocking rate (wethers/ha) and intake of pasture and supplement (tonnes DM/ha.yr) when wether numbers were adjusted monthly, seasonally or annually to maintain a residual pasture herbage mass of 1000 kg DM/ha. Mean annual rainfall at Gowrie (1906–2005) was 667 mm (Figure 2) and as for other centres on the North-West Slopes of NSW, rainfall for 1900–99 was lower in the first 50 years of the century compared with the second 50 years (618 v. 711 mm). Rainfall variation was also high between years with 40% of years having 50 mm more rainfall than the mean and 40% of years having 50 mm less rainfall than the mean. See the northern NSW Climate page for further detail . Predicted pasture intake was higher in years of higher total annual rainfall and the relationship significant (P=0.05) for each of the pasture types examined. However, the relationship was not strong since total annual rainfall does not reflect the distribution of rainfall events throughout the year. The exact nature of the relationship between annual rainfall and pasture intake was variable with, for example, the fertilised native pasture (with or without subterranean clover) failing to meet intake in the lower rainfall years (i.e. those years <10th percentile for annual rainfall). However, in the 18 years that the lucerne pasture failed to provide intake, only one of them occurred in the <10th percentile rainfall years and 15 were in rainfall years between the 10th and 50th percentile. What was the best pasture to meet animal requirements? a mixture of perennial and annual species – native pasture with subterranean clover. The pasture that best met the intake requirements of the Merino ewes rotationally grazing over a 100-year period of variable climate was the fertilised native pasture containing a mixture of C3 and C4 perennial native grasses, oversown with the winter-growing annual legume, subterranean clover. With a variable climate this broad mix of seasonal growth habits and perennial and annual species, probably allowed different environmental niches to be exploited. Overall, lucerne provided just 47% of total mean intake over all years (Figure 2a), while the fertilised native pasture provided 61% (Figure 2b), and the fertilised native pasture oversown with subterranean clover provided 73% (Figure 2c). The lucerne pasture provided >80% of the total intake in only 25% of years, compared with 42% of years for the fertilised native pasture and 50% of years for the fertilised native pasture oversown with subterranean clover (Figure 2 a-c). The lucerne monoculture least met predicted animal intake requirements, although lucerne is reputed to be a productive perennial legume in this environment. Its predicted poor performance was associated with a high proportion of years of below average rainfall (50 years in the 100-year record) and a high proportion of very dry years, with rainfall in over 30% of all years being more than 100 mm below average annual rainfall. In the lowest 25% of rainfall years, lucerne pastures contributed least (<10% of total intake), compared with <34% and <53% of total intake in the fertilised and oversown native pastures, respectively. Although lucerne is relatively drought tolerant because of its deep root system, most of these dry years tended to occur consecutively, thereby exacerbating the effect of the dry conditions. Also, it is acknowledged that these simulations were at a conservative stocking rate (<8 DSE/ha) for fertilised pastures, but this rate was determined by a local producer focus group (McCormick et al. 2009) and so was relevant to on-farm practices. On ‘real farms’, it is important to integrate a range of different pasture types and forages to both take advantage of climate variability in good seasons and minimise its impact in poor seasons, because no single forage type is best in all years. However, previous simulations of farms with multiple paddocks and pastures/forages have indicated that in dry years and seasons, which unfortunately occur with regular frequency on the North-West Slopes of NSW, some supplementation will be required to maintain ME intake, even at relatively low stocking rates. Figure 2. 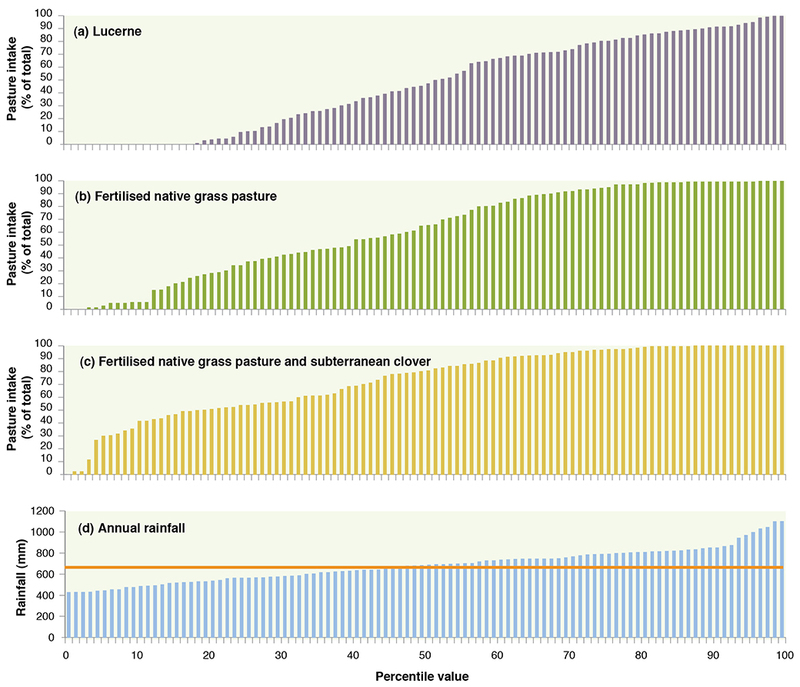 Distribution of percentile values (0-100) for predicted pasture intake (expressed as a percentage of total intake) for pastures of (a) lucerne, (b) fertilised native perennial grasses, and (c) fertilised native perennial grasses oversown with subterranean clover together with (d) the distribution of annual rainfall (mm) for the period 1901-2005 at Gowrie, NSW. Mean monthly predicted pasture growth ranged from 2.6 kg DM/ha/day in winter to 36.2 kg DM/ha/day in summer (Figure 3a), reflecting both the frost sensitive nature of the dominant C4 native perennial grass and their ability to respond to summer rainfall and high temperatures. 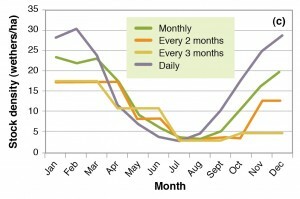 In terms of being able to rapidly change stock densities, these large seasonal differences in growth rates are a challenge and indicate short timeframes for increasing stocking rates or buying and selling options, and at the whole-farm level the need to fill the winter-early spring ’feed gap’ if breeding enterprises are being considered. Available options would therefore be limited to trading in young sheep for red meat production and the use of sown pastures, winter fodder crops, oversown legumes and supplements for alternative livestock enterprises. Under continuous grazing, increasing stock density from 1 to 10 wethers/ha increased mean annual predicted pasture intake from 0.5 to 2.9 t DM/ha/yr (Figure 3b) and increased predicted pasture utilisation from 10 to 49%. 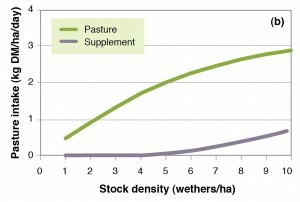 However, at stock densities above 5 wethers/ha the intake of supplements as a proportion of total intake rapidly increased (Figure 3b) indicating that total intake exceeded pasture growth in some years. In the continuously grazed simulations, mean annual pasture utilisation was 29% for 3 wethers/ha and 49% for 10 wethers/ha, but there was considerable inter-annual variation, ranging from just 15% for the lower stocking rate to a maximum of 69% for the higher rate in any one year. At the low stocking rate pasture utilisation was higher in the dry years and lower in the wet years. At the high stocking rate utilisation tended to be low in the dry years and high in the wet years, reflecting differences in the ratio of total intake and pasture growth and quality among seasonal conditions. 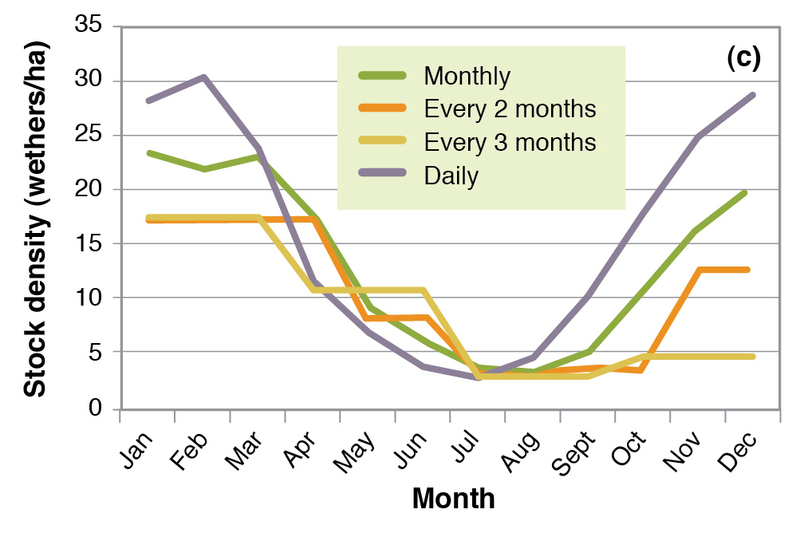 Varying stock density either daily, monthly or every two or three months according to feed availability allowed higher stock density in summer, but had little effect in winter (Figure 3c), highlighting the temperature restrictions on pasture growth in the winter months. Maximum monthly stock densities in summer ranged from 30 wethers/ha for the daily adjustment to 22 wethers/ha for the monthly and 17 wethers/ha for both the two and three month adjustments (Figure 3c) and were lowest in July (~3 wethers/ha for all variable stocking rates, Figure 3c). 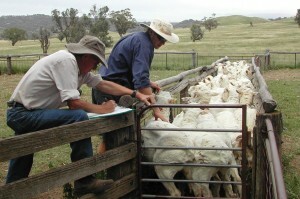 Shortening the time-frame for making decisions about stock density based on a simple measure such as feed availability markedly affected pasture utilisation, increasing it from 54 to 62% as the time decreased from three to two months, and from 76 to 89% as it decreased from one month to one day. 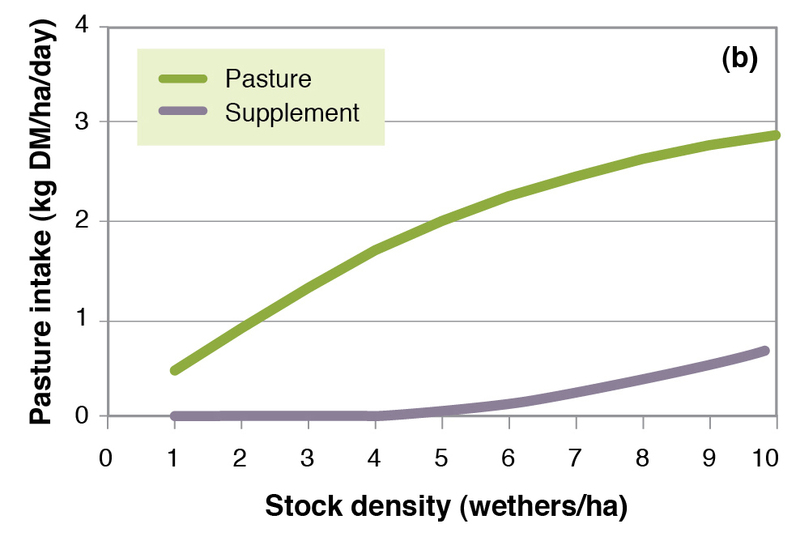 Clearly, these values demonstrate that increasing stock density is a simple way to increase pasture utilisation, but as stock density increases, pasture utilisation as a proportion of total feed requirement may decline. 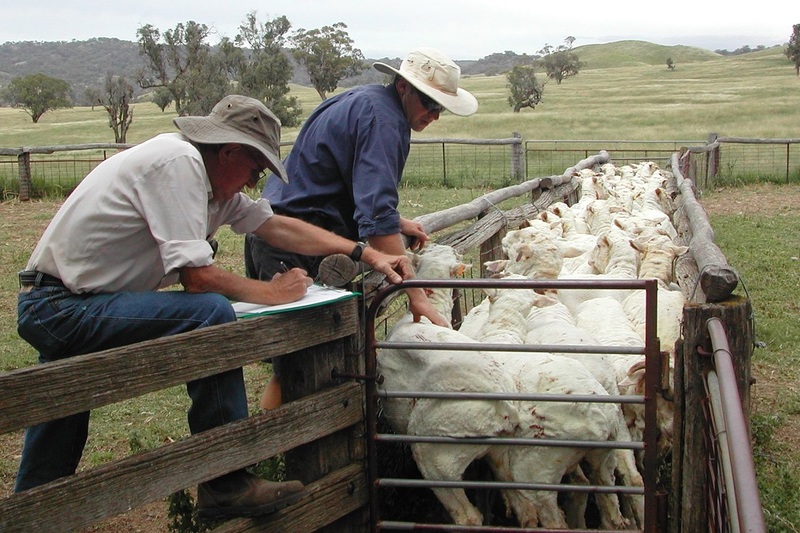 No supplementation was required for any of the variable stocking rates, although mean predicted stocking rates varied from 16 wethers/ha for those adjusted every day to 9 wethers/ha for adjustments made every three months. While a short time interval of one day may not be practical for adjusting stock densities, our results illustrate that more regular adjustment of stock density in response to pasture growth improved utlilisation and intake over time. For the current simulations, a 20% increase in predicted pasture utilisation of a native pasture stocked at 3 wethers/ha (the winter carrying capacity) could be achieved in two main ways. 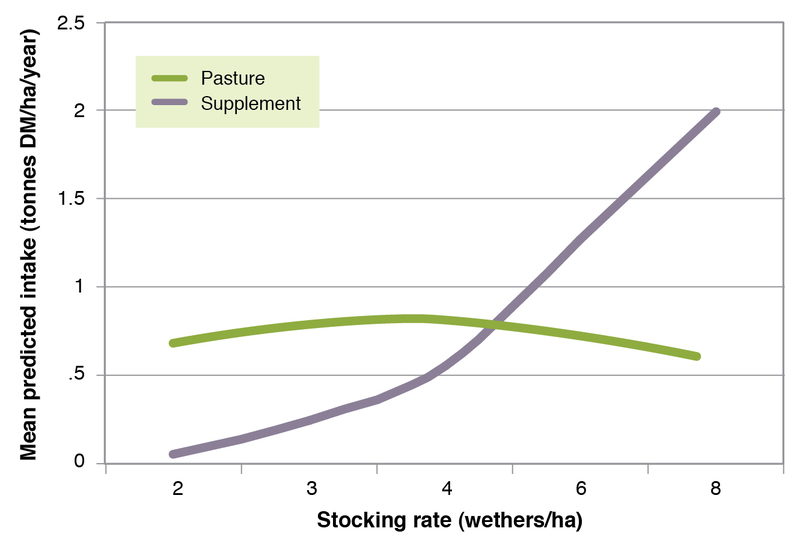 Increase the continuous stocking rate to 10 wethers/ha (pasture utilisation increased from 29 to 49%), but at the higher stocking rate about 20% of the total intake will need to be met from supplementary feed (mean predicted intake of 0.7 t DM/ha.yr), occurring mostly in the drier years. Maintain a stocking rate of 3 wethers/ha and also opportunistically trading lambs in summer−autumn to utilise the extra feed grown in most years and adjust overall stock density every three months based on feed availability. More complex changes could be made to increase pasture utilisation, but these would require adjustments to the feedbase to increase pasture growth at those times of the year when it was limited (i.e. growing different pastures and forages to meet winter-early spring demand) and increasing intake by changing from wethers to breeding enterprises. Figure 3 (a) Mean monthly pasture growth (kg DM/ha.day), (b) mean annual animal intake (t DM/ha.yr) for stocking densities of 1-10 wethers/ha and (c) mean monthly stock densities (wethers/ha) for variable stocking rates with stock density adjusted monthly (1m), every two months (2m), every three months (3m) or daily (1d), according to feed availability. Figure 4. Spring 2009 showing Merino ewes and lambs grazing native perennial grass pastures showing very low green herbage mass, but high dead herbage mass, b) ungrazed lucerne pasture. Climate variability and drought are common events so should be considered as part of day-to-day management. On Red Chromosol soils of northern NSW, drought is effectively never more than 6 weeks away, as in this time reserves of stored soil water can be depleted and pasture growth will cease! The modelling undertaken in this study showed that under these variable conditions, flexible stocking rates provide opportunities for higher pasture utilisation and can reduce the reliance on supplementation. Condition targets and energy requirements of each livestock class on the property (see Reference Tables 10 and 11 and the Lifetimewool and More Beef from Pastures websites). Using a simple spreadsheet to calculate changes in sheep numbers using the livestock months (LSM) concept. Simple calculations can also be done using the ‘How long will my paddock last?’ or ‘How much feed will I have?’ calculators provided in the EverGraze Feedbase Planning and Budgeting Tool. Further information and tools can also be found under On Farm Options – Feed Budgeting and Tactical Management. In a variable climate, such as northern NSW, the pasture base needs to incorporate a proportion of both cool and warm season forages in order to fill the winter-early spring feed gap for green feed and to take advantage of rainfall in what ever season it occurs. This can be done by determining the proportion of paddocks with native perennial grasses, sown grasses and legumes, and forage crops required according to the livestock enterprise being run. 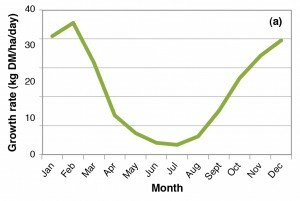 Again, a simple calculator which utilises the livestock months concept can be used to compute changes in required pasture types/areas, timing of reproduction and stocking rates. The modelling done in this study suggests that a pasture base with a diverse mix of species and legumes was best placed to meet livestock requirements in the long-term, as opposed to concentrating on a single species monoculture. Intake requirements for Merino ewes and lambs was best met by a fertilised native pasture containing a mix of C3 and C4 perennial grasses, oversown with an annual legume, because of the broad mix of seasonal growth habits. a perennial species monoculture, lucerne, while a highly productive legume, provided only 47% of total annual animal intake for Merino ewes and lambs over a 100-year period, because of the impact of a high proportion dry years. Further information on integrating forage types and supplementary feeding in the region can be found in the Tamworth Proof Site Key Message – Spring lambing ewes grazing native grass pastures need help to achieve high weaning percentages. The case study Integrating forage sources for success, John and Laurie Chaffey, also provides an example of how changes in forage sources can help to meet livestock targets and manage variability. Further information on the principles for making strategic decisions about pastures and livestock systems can be found in the EverGraze Exchanges Livestock Systems, and Pastures for Place and Purpose. Establishing new pastures is expensive and should be carefully considered. The Guide to assessing the costs and benefits of Pasture Establishment, and the EverGraze Pasture Improvement Calculator can be used to help with these decisions. Climate variability, both within years and between years, in northern NSW creates a unique and challenging environment for livestock producers to run productive enterprises. More than 50% of years have annual rainfall below the average and up to one third of years have rainfall more than 100 mm below average, with many of these years occurring consecutively. While rainfall distribution is summer dominant, effectiveness of this rain is lower at that time of year due to high evaporation rates and losses through surface runoff. 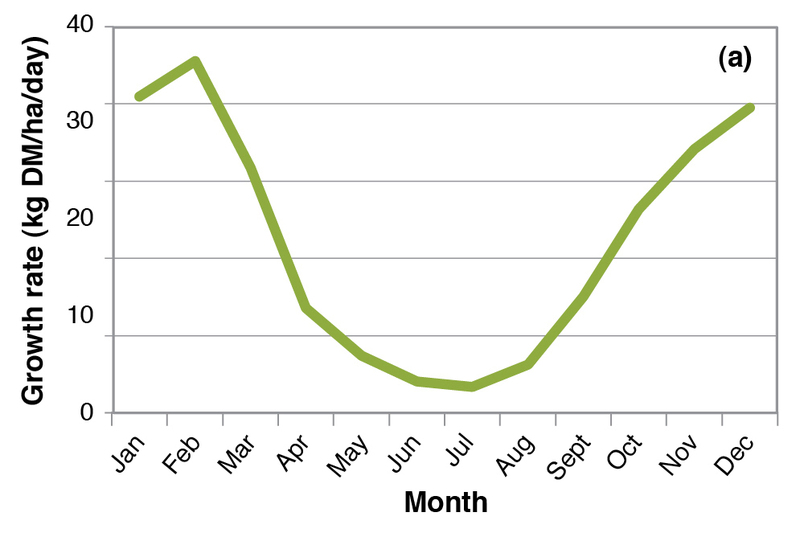 Pasture growth tends to be start-stop in all seasons and is rarely sustained for periods longer than 6 weeks. Therefore, strategically, each farm needs to integrate a range of pasture options (in different paddocks) that can be productive at different times of the year to take advantage of rainfall in the season when it occurs and so meet the recognized feed gaps in winter and early spring. Other general strategies that could assist in achieving a better balance between pasture growth and intake and so increasing pasture utilisation include; using flexible stocking rates that are at or above the annual carrying capacity of the pasture; more closely matching seasonal differences between feed grown and animal demand; using buying/selling to provide flexible stock densities, and using grazing plans, forage budgeting and the monitoring of pasture, animal and land condition. Tactically, adjusting stocking rates on at least a monthly or seasonal basis in response to available pasture will increase pasture utilisation and will reduce requirements for supplementary feed. Lodge GM, Johnson IR (2007) Impact of climate variability on predicted annual pasture intake of sheep grazing native pastures in northern NSW. In ‘Proceedings of the 22nd Annual Conference of the Grassland Society of NSW’. (Eds D Garden, H Dove, T Bolger). pp. 54-55. (Grassland Society of NSW Inc.: Orange.